Spring in Virginia and the Bluebells blooming means it's time again for the Bull Run Run. 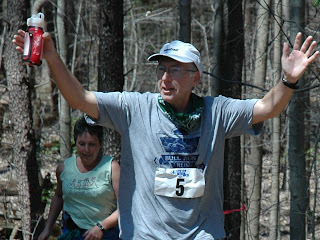 It can also mean mud, and fickle weather.Here I am in 2005 acknowledging the cheers of all my fans as I come into the Fountainhead Park Aid Station. Thats Janet Vincent right behind me. This was the first time I met her. It got quite warm that year and there was a lot of mud. Last year was even muddier and a cold front moved in and some folks were dealing with hypothermic conditions. So what will we have this year? Looks like it might be a tough one with a high of maybe 50F and rain in the afternoon. 2005 was the only time I have run the race. I was training for MMT and had just paced 37.5 miles the weekend before so I wasn't expecting to run very well. I was actually feeling good early on and running with Graham and Dru for a while. Graham and I stuck together for 15 miles or so and then he pulled ahead. I was really struggling the last 15 miles and had to sit along the riverside several times trying to pull myself together and get my stomach settled so I could get some gels into me. Finally started feeling good the last 5 miles. I'm looking forward to a much better performance this year.